Grand One’s Bedroom is Blue, with space things. I’m not doing planets. So it’s a bit of blue, red and a tan background. 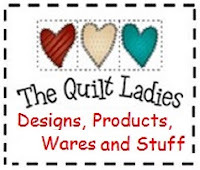 I always start with a pattern, I have a software program, but for years I used graph paper. The size, the block, borders and binding, all right in front of me, usually doing the sections for a couple of blocks at a time. 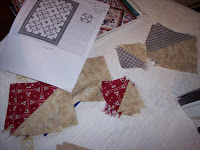 I don’t like cutting yards of material and then putting one block together and then not liking it. Plus I need to see the end result. I know no one will notice, but this is the same pattern as his first baby quilt 6 years ago. 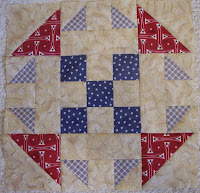 That one was hand quilted, this one will be tied as I know how it will be loved, washed and washed. 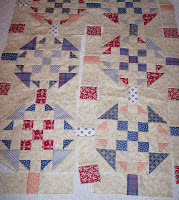 This will be his 4th quilt. He love’s them. I love that. 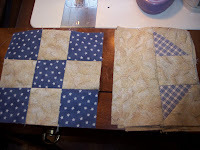 I have the blocks finished and I’m going to get them all put together and off of the sewing room.